Properties in Bangalow Historical Museum & Tea Rooms average 4.6 out of 5 stars. Stylish peaceful accommodation in the Byron hinterland on 5 acres with pool. Property 6: Stylish peaceful accommodation in the Byron hinterland on 5 acres with pool. Easthill-Quiet Coastal Retreat. Couples /Families. Close to all Attractions. Property 17: Easthill-Quiet Coastal Retreat. Couples /Families. Close to all Attractions. Songbird. Federal Byron Hinterland . Perfect place to recharge ! Property 22: Songbird. Federal Byron Hinterland . Perfect place to recharge ! Macnicol Cottage / Pet Friendly / Wheelchair access. Property 23: Macnicol Cottage / Pet Friendly / Wheelchair access. Ardeevin watch the whales swim by. Property 29: Ardeevin watch the whales swim by. 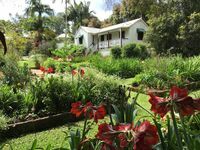 Frangipani Cottage, a relaxing home away from home. Property 44: Frangipani Cottage, a relaxing home away from home. We had a fantastic time in the fig tree cottage, it is very well located (between Byron and Bangalow) comfortable and spacious! Outstanding property and also outstanding hosts. This is a marvellous stay for anyone visiting Bangalow. The cottage is absolutely delightful with all home comfort amenities. Ellen and Keith are the hosts with the most. So helpful and friendly. We stayed there last year also and had no difficulty deciding to go back.